Cherri Delesline does not quietly observe injustice. She acts. Cherri was 17, a high school dropout and working in a fast food restaurant in Charleston, S.C., when she began to organize. She just didn't know what to call it. At the time, she worked with a male manager who inappropriately flirted with young female workers. She remembers how that manager fired a young woman on the spot because she wasn't cleaning the restaurant lobby in the way he demanded. So she led a walkout with the other teenagers in the restaurant in protest. "He fired her for no reason; she was doing her job," Cherri says today about that moment. "I told the other workers, 'You all can put up with it, but I'm not about to do it.' So I grabbed my stuff and the whole store walked out with me." For about three hours, only the supervisors were left to take the orders and serve customers. The district office called Cherri to negotiate, and they returned to work with a small raise. By the next week, that manager was no longer working in the store. And so it's always been with Cherri Delesline. The single mom is humble but outspoken for what she knows is right. She knows she can't sit on the sidelines. On Thursday night, September 22, the Center for Community Change (CCC) will recognize Cherri as its first Emerging Change Champion. The award was established this year in partnership with the Petra Foundation to recognize emerging or overlooked champions of change who work to build power for communities of concentrated poverty and communities of color. It is one of five awards that CCC presents each year to honor leaders and partners in the fight for economic equity and social justice. Given her youthful experience as an inadvertent social justice warrior, her path to organizing seems inevitable. It is no surprise that today Cherri has become a leader in the national Fight for $15 movement. Two years ago, on an afternoon shift at the McDonald's where she worked, a labor organizer drove up and asked her if she liked working in fast food and whether she felt her pay was fair. Cherri was clear: no. She'd been working at McDonald's for almost 10 years by then and had received only a 10 cent raise during her time with the company, from $7.25 to $7.35. She worked full time at the restaurant, often eight to 10 hours a day, and held a second job at a convenience store. But as a single mom with four girls under 12, all of her work did not pay enough to cover rent and utilities and her family's food and clothing. "By the time you paid all your bills, you were broke," she says. It didn't take much convincing for her to join the burgeoning movement of fast food workers fighting for higher wages, demanding respect, and calling for an end to racial discrimination on the job. She remembers meeting with the organizer to talk about the movement that same night. She brought four other people with her, and by the next week, they had signed up the whole store to join the Fight for $15. "It's hard work because people are scared," she says. "They feared they could lose their jobs." But to do nothing is even worse, Cherri says. She shared her reasoning with her co-workers and other fast food workers throughout the city of Charleston. "If we do not stand up for ourselves, if we do not do this now, our kids will suffer," she says. "I don't want to let them suffer like me. Something has to be done. For me, my kids were my motivation." Organizing became a family affair. Cherri often brings her girls to rallies and strikes of fast-food workers across the city. With all the fire and heart of a born organizer, Cherri is determined to fight for what is right - whether alongside her co-workers or her neighbors. Last year, while the nation grieved the killings at Emanuel African Methodist Episcopal Church, the Ku Klux Klan posted recruitment flyers on cars to intimidate residents of Cherri's north Charleston community. "I wanted to let people know what was going on," she says. 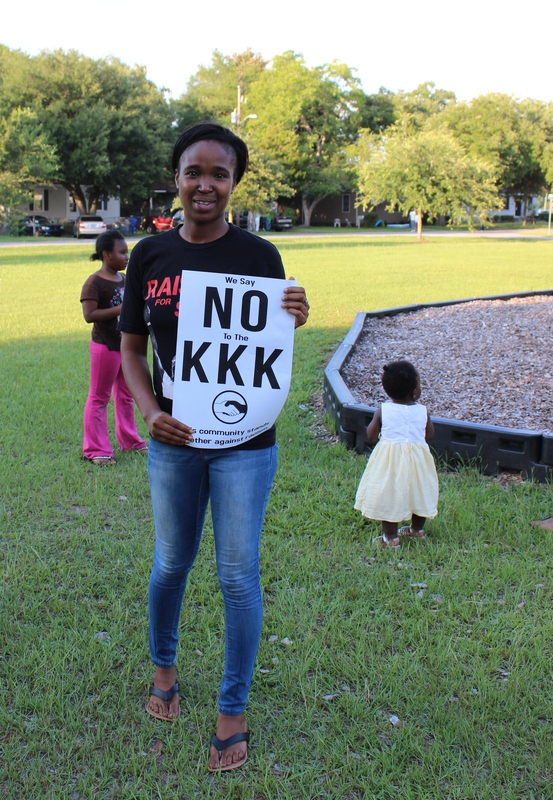 She organized community meetings and spoke out about the Klan's efforts. The neighborhood hasn't seen one Klan flyer since. "Cherri does not draw attention to herself," says Kerry Taylor, a history professor at the Citadel and social justice advocate who has worked with Cherri. "But somehow she commands the complete respect of her co-workers. If she says, this is what we are going to do, people just followed her. They trust her." He says Cherri embodies what it means to be an organizer: someone who commands respect, who articulates the struggle and who is thinking about the broader mission of social justice. 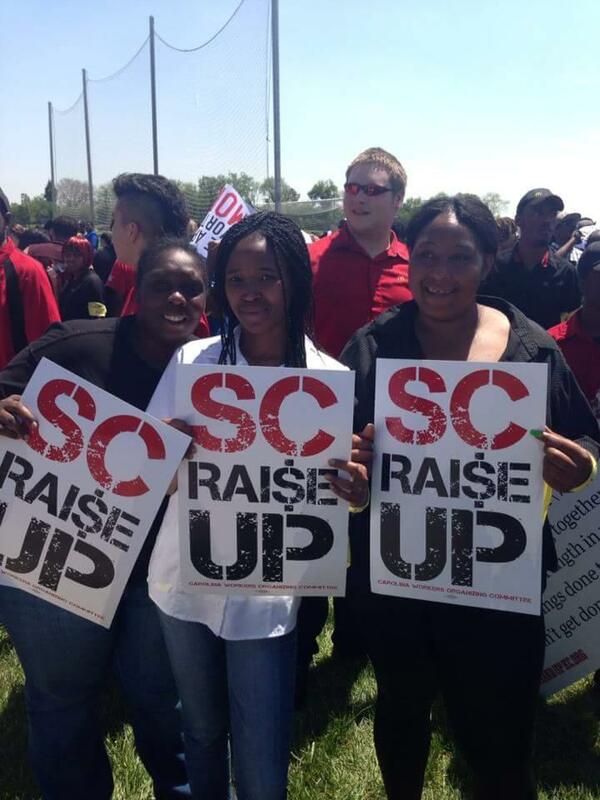 Charleston's fast food workers remain underpaid--South Carolina is one of five states with no minimum wage. But Cherri's not done organizing. She and her co-workers have vaulted the Fight for $15 into a national--and now global--movement. At least a dozen cities and counties as well as California and New York have approved a $15 an hour minimum wage. Cherri no longer works at McDonald's. She is finishing her course work to get her GED--hopefully by next month. She's not quite sure what campaign she will focus on next. But she knows there will be another campaign. "I consider myself an organizer," she says. "It's been instilled in me. I will forever be an organizer." Marisol Bello is a senior political writer for the Center for Community Change.